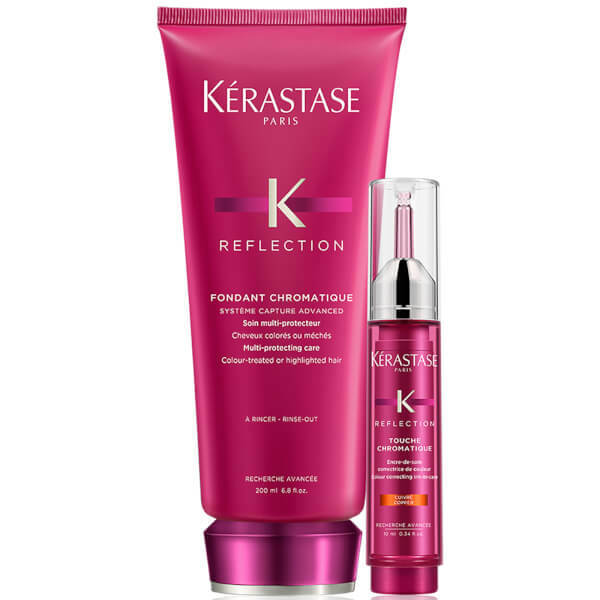 The Kérastase Reflection Fondant Chromatique & Touche Chromatique Duo in 'Copper' offers personalised care for your copper, colour-treated hair. Combining an ink-in-care, highly concentrated hair dye formula with a nourishing, shine-enhancing conditioner, the pair work in tandem to correct and brighten colour for restored softness, colour luminosity and radiance. 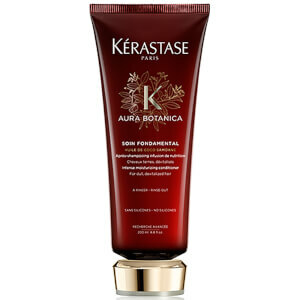 A radiance-enhancing conditioner specially developed to soften and revive colour-treated hair. Expertly detangling whilst protecting colour, the nourishing conditioner utilises Système Capture Advanced to help neutralise external aggressors that can compromise colour, and a blend of chelators, UV Filters and Vitamin E to help prevent colour fading caused by water particles and oxidative aggressors. Leaving hair feeling soft, supple and smooth, it contains Rice Bran Oil to emphasise light refraction so hair looks glossy, healthy and vibrant with enhanced shine. A colour-correcting hair dye formula specially developed to be mixed with Fondant Chromatique or Masque Chromatique. The ink-in-care formula helps to revive and correct your hair; it helps neutralise unwanted yellow tones for a radiant, enhanced copper finish. The highly concentrated hair dye revives colour whilst being gentle to hair; it helps promote colour evenness and prevents fading for long-lasting, vivid colour. When mixed with the conditioner, it treats the hair fibre to promote healthy-looking strands. Expect smooth, shimmering and radiant tresses with vibrant, revitalised colour. Mix 10 pumps of Touche Chromatique in 15ml of the Fondant Chromatique. Apply to shampooed and towel-dried hair. Massage lengths and tips. Leave on for 5 minutes. Rinse thoroughly.